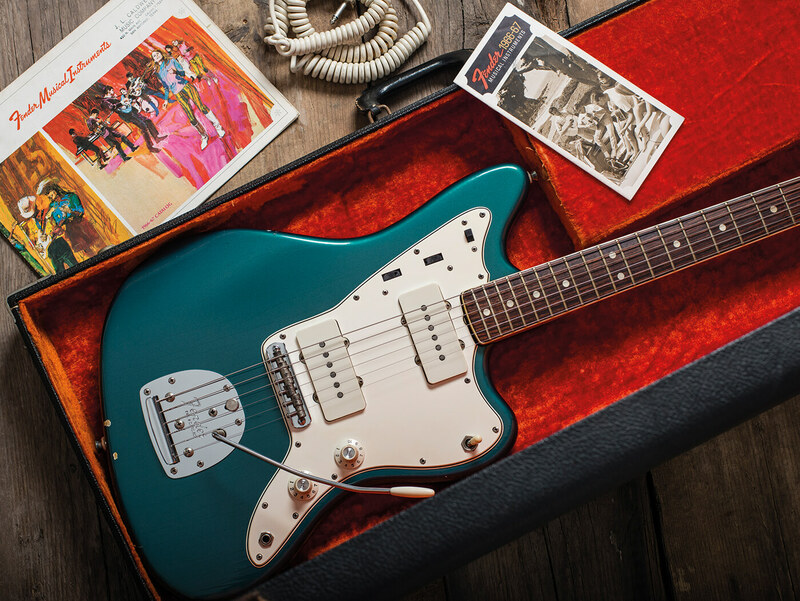 That’s more or less what happened with this 1966 Jazzmaster. It was sold to ATB Guitars in Cheltenham, England as a Sherwood Green example. On arrival, closer examination reveals the finish to be the equally rare and arguably more attractive Ocean Turquoise. Online pictures can be misleading when it comes to colour, so it’s always best to examine original guitars in person. But when they are so rare, how many of us will ever get the chance? This is our first encounter with a vintage Ocean Turquoise Fender, but a friend has an old Sherwood Green Strat and it looks very different. Sherwood Green has a mossy darkness and can look rather grubby with age. There is an unmistakable hint of green to this Jazzmaster’s hue, but where the finish is chipped, we can make out a more vivid blue layer. Yellow stain is also visible under a layer of Fullerplast, as is an off-white base coat. 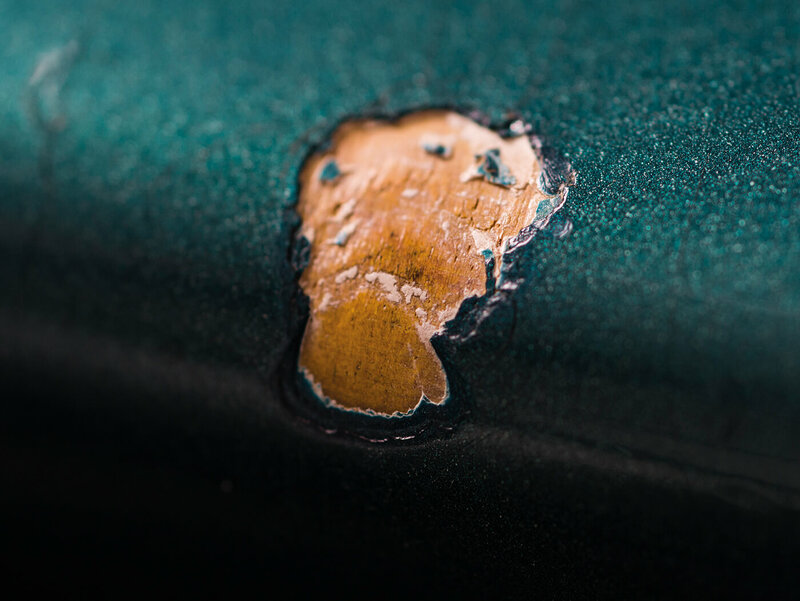 Like all of Fender’s original metallic finishes – with the exception of Candy Apple Red – the metallic particles were suspended within the paint, so spraying was a one-step process. Mixing blue and yellow produces green – hence the green tint from the yellowed nitrocellulose lacquer top coats. It’s too dark to be Ice Blue, too light to be Lake Placid, and too blue to be Teal Green – so we’re convinced this is Ocean Turquoise. Even so, we’ve seen vintage Lake Placid Blue finishes with nitro top coats that have aged to be almost indistinguishable from this. In those instances, evidence of the original hue can usually be found beneath plastics or hardware. Fender offered Ocean Turquoise from 1965 to 1971, but it was originally created by Dupont for Ford, and it was first seen as Twilight Turquoise Metallic on 1964 Mustangs. It’s actually an acrylic, but even so, there’s checking all over the body in a particularly intricate and attractive pattern. The headstock matches in colour only, because it’s largely crack-free. Another notable neck feature is the combination of fingerboard binding and pearly dot markers. The former was introduced in late 1965 and blocks replaced the dots in mid 1966. 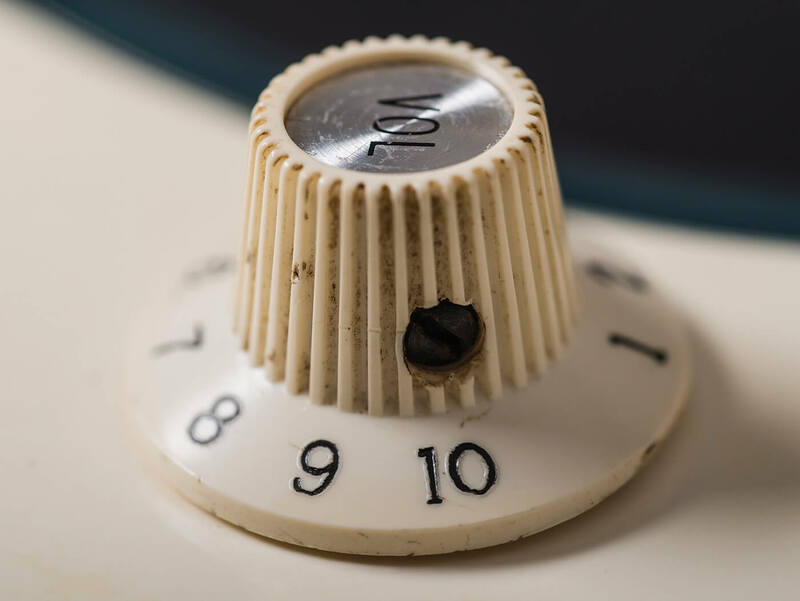 With a March ’66 neck date, a mid ’66 serial number and potentiometer codes from the 12th week of 1966, everything appears correct and we’re assured that all the solder joints are original and unbroken, too. This Jazzmaster left the factory just prior to Fender’s tuner change – rather than ‘F’ stamped machineheads, this example has the earlier double-line Klusons. 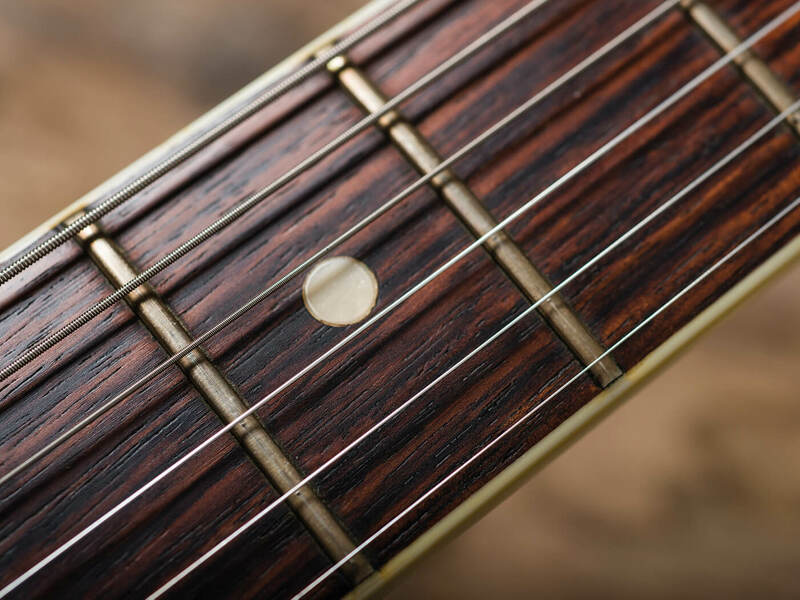 The plastics are still a vibrant off-white and the gorgeously grained rosewood fingerboard shows no traces of wear. The neck lacquer probably looks much as it did when the guitar was new and the frets are similarly unworn. 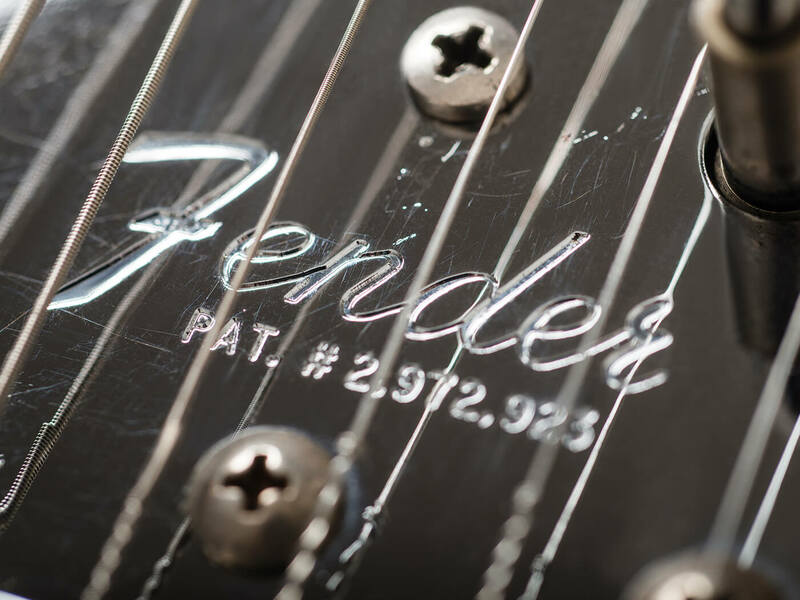 It appears that Fender made an attempt at fret nibs, but they have either worn away or, more likely, the nibs weren’t particularly prominent in the first place. The nut nibs are a curious feature, and the fretwire appears a tad wider than the super-skinny stuff seen on earlier Fenders. If you like candy in your case, this guitar is a treat. Lifting the compartment lid reveals a period coiled lead and the original strap, which is totally unused. There are also two 1966-67 Fender catalogues, which are fascinating period pieces. 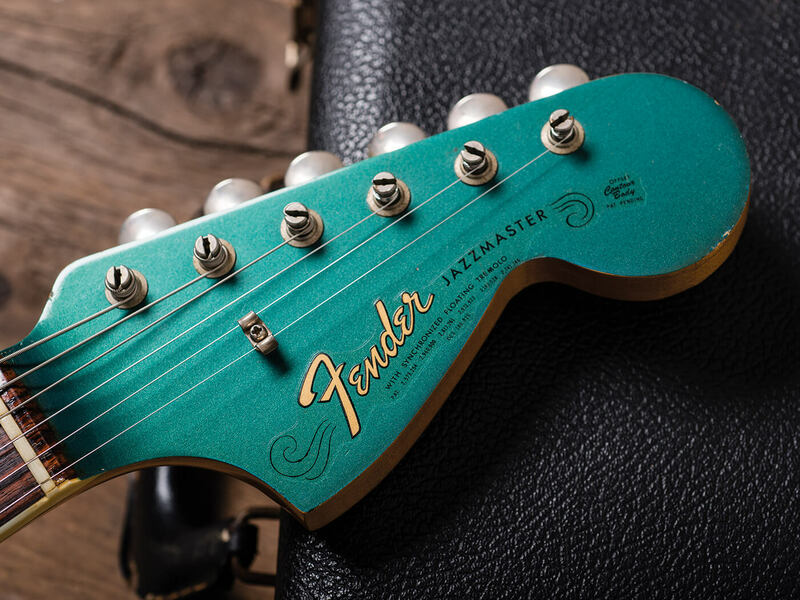 Some Fenders have a distinct tone and feel before you even plug them in. This Jazzmaster is exactly as expected, with a bendy elasticity, a twangy and woody tone and plenty of sustain. 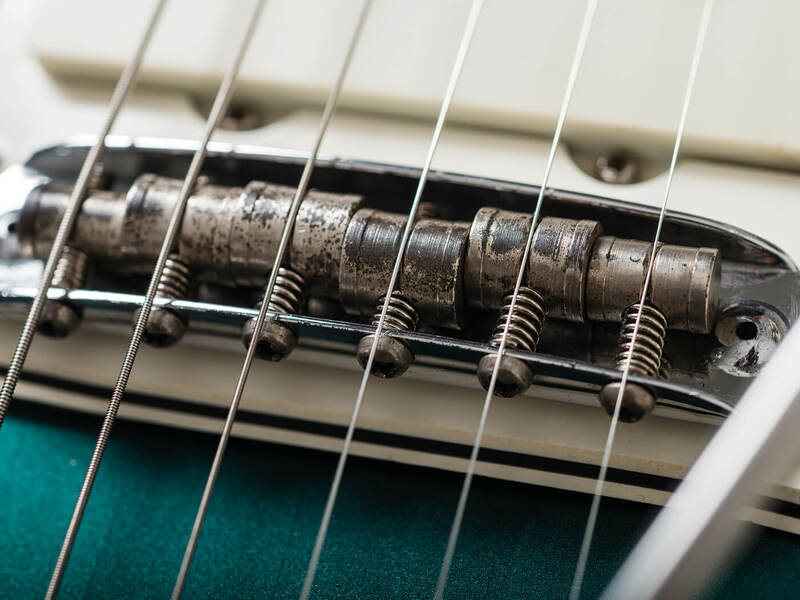 An old Mustang bridge retrofit may be helping with stability, because the strings stay put – even when they’re thrashed – and tuning remains stable with heavy trem use. All the electronics work properly and the pickups produce a warm and full tone with ample fidelity. 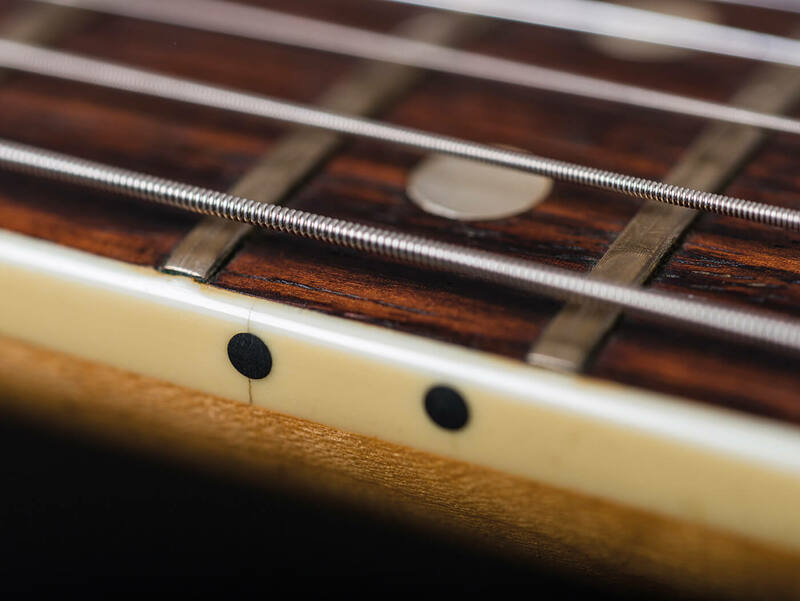 There’s a useful contrast between the two settings, with the bridge producing a snappy sparkle and the neck capturing more of the guitar’s acoustic tone. In between, it’s phase-cancelling and since the pickups have little to no microphony, it behaves impeccably with fuzz. We also get pretty lost in reverb and tremolo while testing through a ’66 Princeton Reverb, because there’s nothing more atmospheric than a fine Jazzmaster. Raising the height of the pickups would no doubt improve the tone, but that would probably entail replacing the foam beneath. 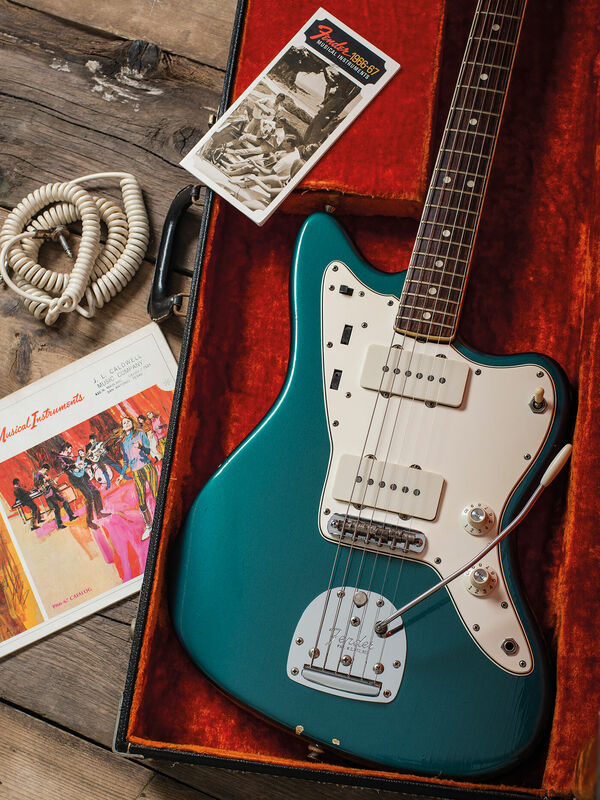 All things considered, this guitar does everything you could ask of a Jazzmaster and we particularly like the even depth of the rounded neck. It’s fun to contemplate why some vintage guitars survive almost unscathed, while others were played to death. The ‘people only played the good ones’ theory is demonstrably nonsensical – the instrument featured here has simply been cherished or ignored for most of its life. It’s a pleasure to play and sounds tremendous. Without meaning to detract from its playability and impressive tone, we devoted much of our attention to this guitar’s finish. There’s no escaping the fact that it accounts for a substantial part of its appeal to collectors and as a result, it commands a price that’s much loftier than a sunburst equivalent. Ocean Turquoise is something special and we’re baffled that it wasn’t more popular at the time. As collectable Jazzmasters go, this is a prime example with all the extras, and a worrying temptation for Shoegazers of a certain age.